Reposted from the UTech website. (PDF). Professor Stephen Vasciannie, CD (4th left), President, University of Technology, Jamaica and Mr. Peter Harrison (3rd left), President, The Palisadoes Foundation shake hands following the official handing over of network equipment valued at $12M* by The Palisadoes Foundation to UTech, Jamaica and the University of the West Indies (UWI), Mona campus at an official handing over ceremony held Friday, January 19, 2018 at the UTech, Ja. Papine campus. Participating in the presentation (from left) are Dr. Sean Thorpe, Head, School of Computing and Information Technology, UTech, Prof. Nizla Aples, Dean, Faculty of Engineering and Computing, UTech, Dr. Gunjan Mansingh, Head, Department of Computing, Faculty of Science and Technology, UWI, Mona and Mr. Sheldon Powe, President, Jamaica Computer Society. The University of Technology, Jamaica (UTech, Jamaica) and the University of the West Indies (Mona) campus today, Friday, January 19, received a donation of computer network equipment valued at over JA$12M* from the USA based Palisadoes Foundation (LLC). The Palisadoes Foundation is a registered company in the state of California, USA, established by ICT professionals in the Jamaica Diaspora’s Technology Taskforce to promote the use and production of ICT services in Jamaica. The network equipment was formally handed over by Palisadoes Foundation President, Mr. Peter Harrison to UTech, Jamaica President, Professor Stephen Vasciannie, CD and to Dr. Gunjan Mansingh, Head, Department of Computing, Faculty of Science and Technology, UWI (Mona) campus at a special ceremony held at the UTech, Jamaica Papine Campus. Harrison who has built the core web infrastructure for several of Silicon Valley’s internet titans and previously worked in IT at Google and Netflix, pointed out that global companies such as Google, Amazon, Facebook, Oracle, Cisco and others are leaders in the Open Source software movement, adding that “success in Open Source will open many doors.” Open source software is free to download, access, modify and use. Harrison expressed confidence that Jamaica can compete with the best in the world and have the capacity to create globally competitive software engineers and companies through exposure to Open Source software. 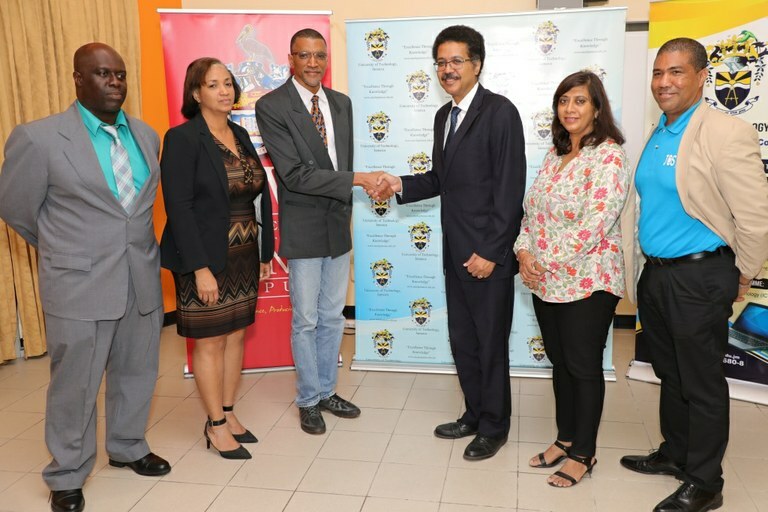 He pledged the support of the Palisadoes Foundation in continued partnership with Jamaican universities and the IT industry towards this goal. Dr. Sean Thorpe, Head, School of Computing and Information Technology, UTech, Jamaica who was instrumental in spearheading the acquisition of the IT equipment for both universities, said that it will support the continuous development of Open Source software projects and will enable the establishment of a Local Area Network (LAN) for students that is separate from the UTech, Ja campus student WiFi network which will enhance student customer experience. He noted Internet access for the equipment will be provided through a dedicated 200 Mbps data circuit. The equipment donation was facilitated through the Jamaica Computer Society (JCS) which has historically collaborated with the Palisadoes Foundation. President of the JCS, Mr. Sheldon Powe said “Jamaica is a lot better for the equipment donation,” and thanked the Foundation for giving back to Jamaica. 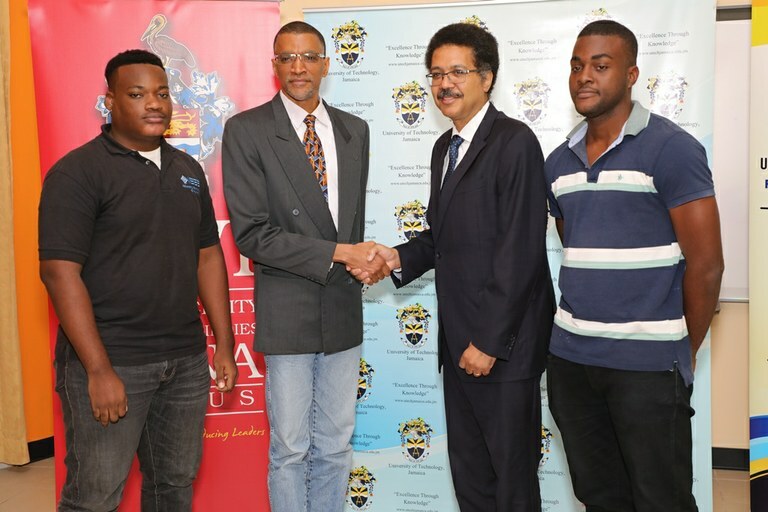 Professor Stephen Vasciannie, CD, (2nd right), President, University of Technology, Jamaica and Mr. Peter Harrison (2nd left), President, The Palisadoes Foundation shake hands following the donation of network equipment worth $12M* dollars to UTech, Jamaica and UWI, Mona. Sharing in the presentation from left are students Mr. Agyei Masters, School of Computing and Information Technology, UTech, Jamaica and and Mr. Mathew Stone, UWI graduate student. 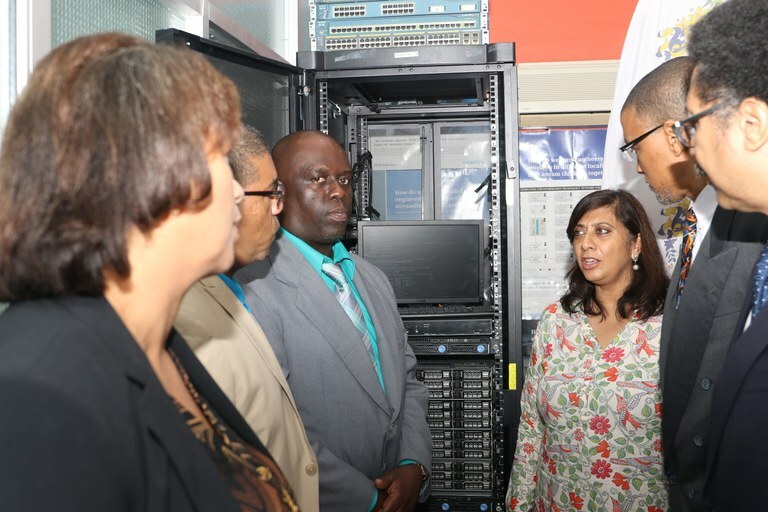 Examining the Network Equipment located at the Server Room in the main lab of the SCIT Building (from left) are Prof. Nizla Aples, Dean, Faculty of Engineering and Computing, UTech, Ja., Mr. Sheldon Powe, President, Jamaica Computer Society, Dr. Sean Thorpe, Head, School of Computing and Information Technology, UTech, Ja., Dr. Gunjan Mansingh, Head, Department of Computing, Faculty of Science and Technology, UWI, Mona, Mr. Peter Harrison, President, The Palisadoes Foundation and Professor Stephen Vasciannie, CD, President, University of Technology, Jamaica.